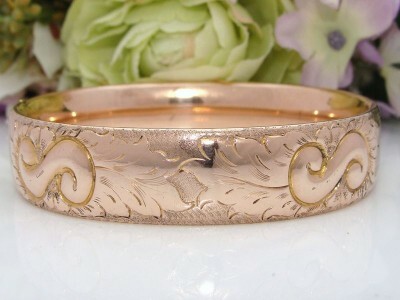 This is a Truly Fabulous Antique Bangle Bracelet – its Quality is unmistakable. The top is hand tooled featuring embossing and chasing with marvelous effect. The combination of smooth, shiny & textured finishes is stunning. The pictures best provide the description which show the level of detail. You certainly do not see this outstanding workmanship or quality with today’s mass produced, machine made jewellery. It is sturdily made with slim sides and is oval in shape and can be worn comfortably as a cuff bangle pushed up the wrist. The back is plain and smooth. Its “hidden hinge” with spring and clasp are functioning as-new, snapping closed securely. It has the silky smooth feel usually only associated with solid carat gold and expected of quality antique/vintage jewellery. It has a warm Antique rose hue that is so much more beautiful in person. Better-than-Excellent Antique condition! There is minimal wear and no damage or repairs evident – it has been used very seldom. It is just Stunning – it is without doubt a real Show Stopper! The finish is Pristine and it looks Awesome on the wrist. You will be thrilled with this sensational Antique Heirloom bangle bracelet.